Advantages: Unit operational use and expansive walk-around.. Recommendation: Recommended to all modelers, regardless of level of experience. Sometimes one plus one can result in much more than two. In this case it the combination of the Mirage PZL P.11c kit with Mushroom Model Magazine’s colorful monograph on the PZL P.11c., which elevates a footnote in aviation history to a fascinating modeling subject. Without this book, I believe the model of the PZL P.11c would remain just another kit of an obscure aircraft of limited interest. The PZL P.11c represents a significant point in the history of aviation. As the authors note in the forward; “The PZL 11c….marked the end of an era of world aviation: the era romantic flying.” Just as the obsolete Polish cavalry was confronted by overwhelming Panzer units, the obsolete P.11c was quickly devastated by the high speed, high performance and heavily armed Bf 109s and Bf110s of the Luftwaffe. There is a brief overview of the development of the P.11 from its introduction in 1931, with a very interesting “family tree” and the specifications for the several variants. But the bulk of the written portion of the book deals with the operational history of the aircraft. The first part of the operational use covers the pre-WW-2 period. It struck me odd indeed too think of the P.11c as a weapon of intimidation. But that is what occurred when there was a massing of air units near the Polish-Lithuanian border in an attempt to get Lithuania to normalize diplomatic relations with Poland. The next part of the book covers the operational use of the P.11c by each of the Fighter Flights that operated this aircraft. This includes the combat record of each unit against the Luftwaffe with date and type of aircraft shot down. There are numerous, and most interesting, black and white photographs. Almost every Fighter Flight is represented by at least on picture. 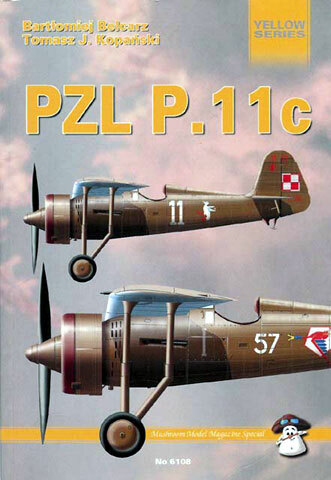 The heart of the book is the extensive, full color walk-around of the restored P.11c at the Polish Aviation Museum. The aircraft is in the marking of 121 Fighter Flight, 2 Air Regiment “Cracow”. The walk-around is supplemented with black and white photographs from the original manuals. This section provides a wealth of information for additional detailing. Finally the books concludes with over 30 pages of profiles (top and side views) in color. The profiles are well done in that they differentiate between P.11c’s with wing guns and those without. Also there are profiles of the P.11c in Rumanian and Hungarian markings. While there is a color profile and black and white pictures, the book does not solve the mystery of the one P.11c painted in a two tone splinter scheme. Regardless of the basis for this scheme, it would be nice to model a P.11c in something other than overall Polish Khaki and Light Blue-Gray. I believe Mushroom Model Magazine’s Yellow Series has come a long way from the first one on the Bf 109 G, which to me, seemed disjointed and superficial. This books is quite interesting on its own, and makes for an invaluable resource in modeling the P.11c. I recommend this book to those aviation enthusiasts and modelers who are interested in Polish aviation in general and the P.11c in particular.